This Dunk Tank with window is sure to be a hit at your next event This tank features a safety fence surrounding the dunking victim, a vinyl ball stop, and a clear plexiglass window so the audience can see ACTION! This tank holds 500 gallons of water that is not supplied by Cowboy Party Rentals. 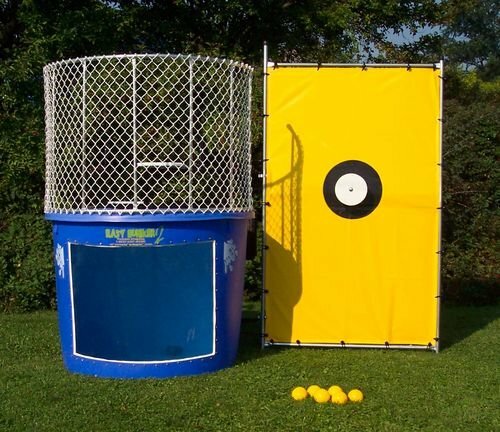 This dunk tank is a great addition for your next corporate party, school field day, or church picnic! Great money maker for festivals and carnivals! This is very wide unit. For backyard parties, a double gate is necessary for entry.